Dr. Shapiro graduated from the University of California at Los Angeles and the Southern California College of Optometry where he graduated with high honors. He is a Fellow of the American Academy of Optometry and past president of the Los Angeles County Optometric Association. He has been in practice since 1978. In 2009 he was appointed by the California State Board of Optometry to serve on the Glaucoma Diagnosis and Treatment Advisory Committee. Dr. Shapiro is currently a member of the Los Angeles County Optometric Society, the California Optometric Association, and the American Optometric Association. Dr. Balfour is a graduate of the University of California at Davis and the Illinois College of Optometry. He has been practicing optometry since 1980. Dr. Balfour is currently a member of the Los Angeles County Optometric Society, the California Optometric Association, and the American Optometric Association. 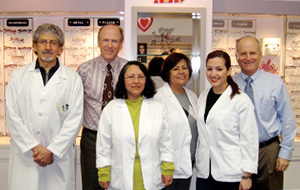 Mr. Maldonado is a registered optician in the State of California. He is a master craftsman skilled in the fabrication, adjustment, and repair of spectacles. Juan has been in our practice for over 26 years. We take pride in superior service to our patients. We are not happy until the patient is completely satisfied. ​Excellent service requires experience. Martha Archila has been with our office since 1981, Cathy Bautista has been an optical dispenser since 1980, and Hilda Toruno since 1987.